Discover 35 Proven Plays and Strategies for an Unstoppable Offense! If you're a youth or high school football coach looking to develop a new play package, get more out of your existing scheme, or simply upgrade the performance of your offense... then please listen closely. This could be the most important thing you'll read all season! 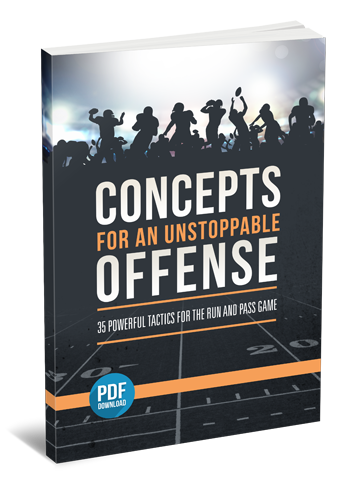 Our new best-selling resource, Concepts for an Unstoppable Offense is jam-packed with 35 powerful tactics you can take right to the field. Including dozens of proven run plays, pass plays, tips, tricks and techniques to jumpstart your offensive production, starting tonight! Learn exactly which base runs and passes you NEED to have in your playbook, and how to “stack” them for maximum effectiveness. Send your offensive production through the roof with just a few simple tweaks. For more yards, more first downs, and more end zones! Dominate your league, earn the respect of your peers, and be loved by your team! If you've already got a working scheme, you can EASILY apply these strategies to improve your offensive execution, efficiency and point production. Or, if you're starting from scratch, this ebook will provide everything you need to develop a dominating run and pass package. 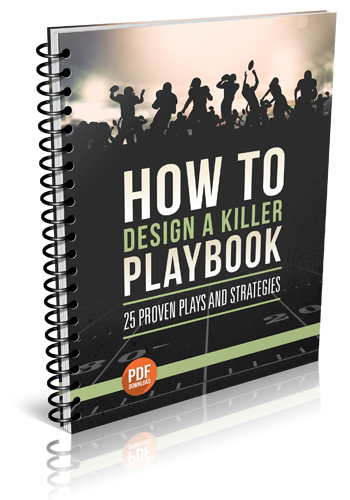 Read this simple report that unlocks the secrets to an unstoppable offense, pick out the plays that will work best for your team... and start taking your league by storm at your very next game! These "plug and play" strategies are fast and easy to learn. And they WILL work for you and your team. No matter what level you coach, or how much experience you have. "Our offense is becoming a well-oiled machine!" After implementing these concepts, we have improved our execution, gotten more "Ws", and had more fun! 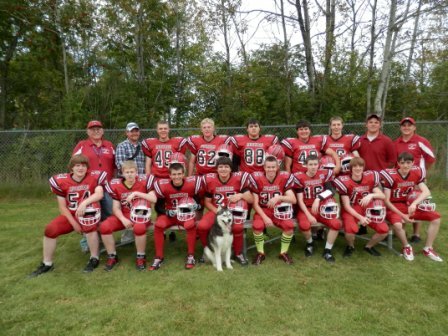 Last season we went from 4-4 to 6-2 and increased our scoring average from 12 pts per game to 18 pts/game. This season we feel very confident we can go 7-1 and average 20 pts per game. Our offense is becoming a well-oiled machine! My favorite part was learning how to develop multiple looks for the same play. It even works for special teams! I would recommend this to other coaches because it makes your life MUCH easier. Peers, parents, and players all gave me more recognition as a coach. Discover the one play every defense HATES to cover. It forces them to be assignment conscious, prevents them from attacking the ball-carrier, and severely limits stunts, blitzes, fronts, and coverage options. How to beat the blitz. Learn 4 "no-sweat" strategies to make your opponent PAY for being overly aggressive. How to use dives, traps, and bellies to keep defenses honest and punish them for over-pursuing. Master this simple concept and you'll break through for at LEAST one 15+ yard run. Every. Single. Game. A HUGE route-running mistake that KILLS your offense. Around 75% of teams are doing this right now... find out what it is, and the easy way to fix it. Sure, I've been studying football offense and "coaching coaches" for a long time - but I still consulted every expert I knew before developing this system. Many of these concepts are based on the work of Steve Axman... one of the most respected (and feared) offensive football gurus on the planet. 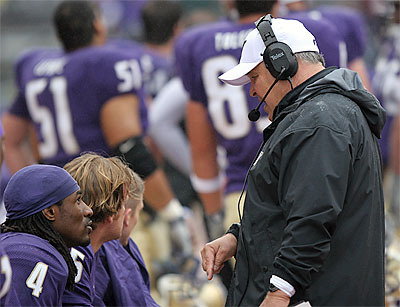 He's served as head coach, offensive coordinator, quarterback coach, and wide receivers coach at perennial powerhouse colleges like UCLA, Washington, Idaho, Stanford and Arizona. And he's one of the most "in-demand" clinic speakers in the country. I took Coach Axman's concepts, studied them, tested them, then broke them down into an easy step by step system that ANY coach can understand. 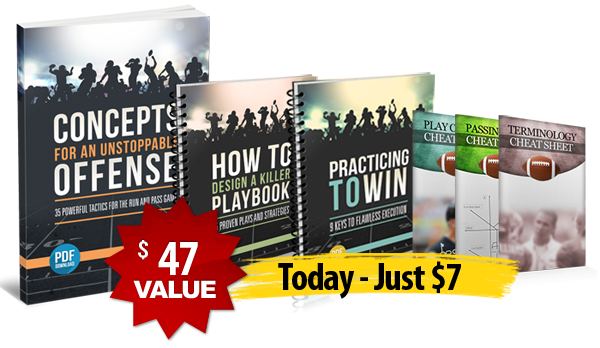 I've pulled together in one simple collection the most essential football plays and strategies you need to develop a powerhouse offense. Everything is explained in plain English with easy-to-remember cues, clearly diagrammed plays, and simple teaching tips along the way. So whether you're brand new to football… or a seasoned pro… you can master these techniques in just one afternoon, and start implementing them at your very next practice! We want to make this resource as practical and easy to use as possible. So we're also including three additional bonuses to help you shorten the learning curve and accelerate your success! 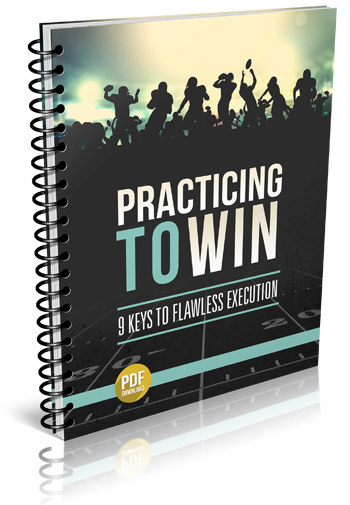 This powerful ebook is filled with 25 simple, straightforward tips and tactics that will transform your offense into a powerhouse! You'll learn how to design an offensive scheme that maximizes the natural gifts of your best players... easy ways to include gadgets and trick plays into your game plan... the one offensive formation you should avoid like the plague... and a lot more. Inside this "quick-learn" report, you'll discover nine critical keys to effectively using your offensive practice time. Including... how to eliminate the missed assignments, dropped balls, and mental errors that are KILLING your team right now... why "teaching the rules" gives your team a HUGE competitive advantage... the 10 special play situations you MUST work on every week... and a lot more. This useful tool explains all the basic "nuts and bolts" of football offense, from play calling, to pass routes, to blocking schemes, to hole numbering. You can use it as a refresher for new coaches, for educating parents and players, or for getting your entire coaching staff speaking the same language and on the same page. an Unstoppable Offense... Starting Today! And it's all simple, proven and FAST to learn, so you can start implementing these strategies at your very next practice (tonight if you want). Picture the fun and satisfaction you’ll experience, watching your offense march the ball downfield against ANY opponent, piling up the wins, and helping your kids develop a love for the game that will last them a lifetime! "Increased our scoring by 5 points per game!" I used to struggle with developing a logical game plan. Using these concepts, I'm now able to approach game planning with a more organized approach. We increased our scoring by 5 points per game in the last two years. I liked the clarity of concepts presented, and would recommend this to ANY coach who needs help with game planning. This package is easily worth $67 on its own. And my plan was to offer everything for the discounted price of $47. Remember, you're getting 35 run game and pass game strategies, 18 proven techniques for designing a killer playbook, 9 keys to top-notch offensive practices, and 3 cheat sheets that will save you hours of time and energy. But if you're one of the next 500 coaches to get in on this you can have it all for the special discounted price of just $7. That's 85% off! $7 puts the report within reach for the vast majority of people. It’s not expensive for even the humblest beginner. Anyone who can afford to invest the price of a fast food dinner and take the time to learn these techniques… can immediately and dramatically improve their football team. All the ebooks are delivered in PDF download format, so you get instant access as soon as your order is securely processed. You won't have to pay any shipping and handling expenses, or wait for anything to arrive in the mail! So if you're serious about becoming a better coach, and if you would like to instantly have a proven plan to score more touchdowns and win more games, click the Add to Cart button below now. I'll even cover your investment with a special "Double You'll Love It" Guarantee. Guarantee #2 - If you actually use these strategies and don't rack up more yardage, score more touchdowns, and win more games, I'll actually refund TWICE your money. But please don't wait - this $7 price is only guaranteed for the first 500 coaches. After that, I plan to increase the price to $47 or more. Time is very much “of the essence.” If you want to start engaging your kids in practice and boost their skills this season, you need to start right now. This coaching system is so essential I’m practically giving it away because I really want your team to start seeing the results right away, and have your best year ever. Click the Add to Cart button below to get instant access to the entire Concepts for an Unstoppable Offense package Risk Free for just $7. YES, I want in! I want access to Concepts for an Unstoppable Offense, plus How to Design a Killer Playbook, plus Practicing to Win, plus the 3 Offensive Football Cheat Sheets. Here’s what to do to order. Have your MasterCard, American Express, Visa or Paypal account ready, and click the Add to Cart button below to continue. As soon as your order is securely processed, we’ll direct you into the members area, where you can download the PDF files to your computer, print them out, or save them to your mobile device to access any time. Your package is waiting for you to claim it. Just $7 gets you instant digital access so you can start using these plays and strategies tonight! 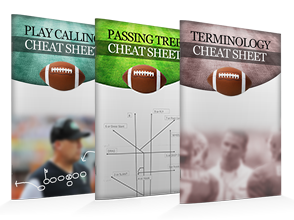 I've already done the research... tapped into Coach Axman's proven system... and compiled it all into this incredible "best of" football coaching collection. There's no need to waste your time searching the web for unproven ideas, or spend hundreds of dollars on coaching seminars. Just download this package today and you'll get instant access to a complete offensive coaching system you can start using today! Click the button above now to get instant access to everything for just $7! Remember, you get a full 60 days to review all the plays and strategies and see if they work for you. And if you're not 100% satisfied I'll send you DOUBLE your money back.